I spent the last week in Saint Augustine, where it was freaking hot. I don't know how you Southern gals do it, I was dripping sweat. Because of the heat, I chose this light dress (last seen here) and minimal accessories for an afternoon of exploring (or, at least an hour of exploring before retreating to an air conditioned bar for many glasses of sangria). I thought I was just heading to the beach for a week, I had no idea that Saint Augustine is such a historic city. It touts itself as America's oldest continuous settlement, and was founded as a Spanish colony in the 1500's. Walking through the streets downtown literally felt like going back in time, that is, until I saw the signs for haunted pirate tours. 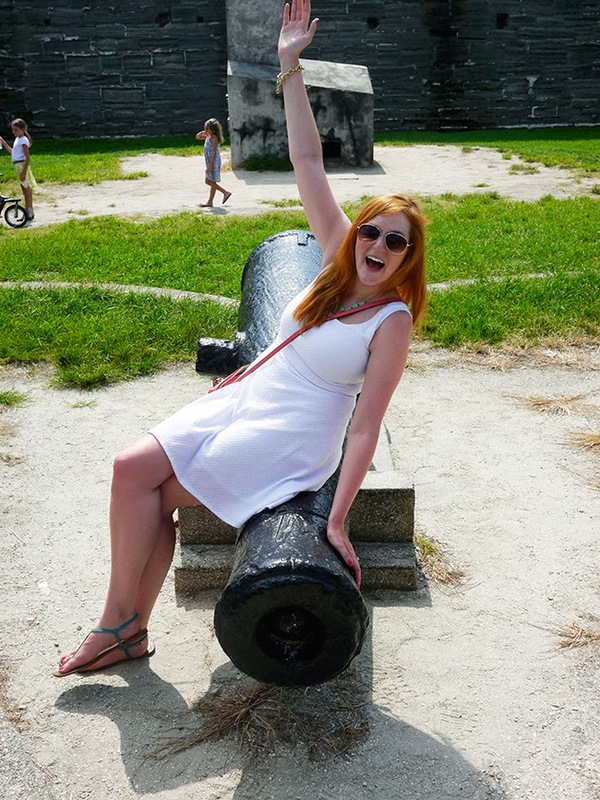 These pictures were taken around Castillo de San Marcus, a fort just outside the downtown that's full of cannonballs. 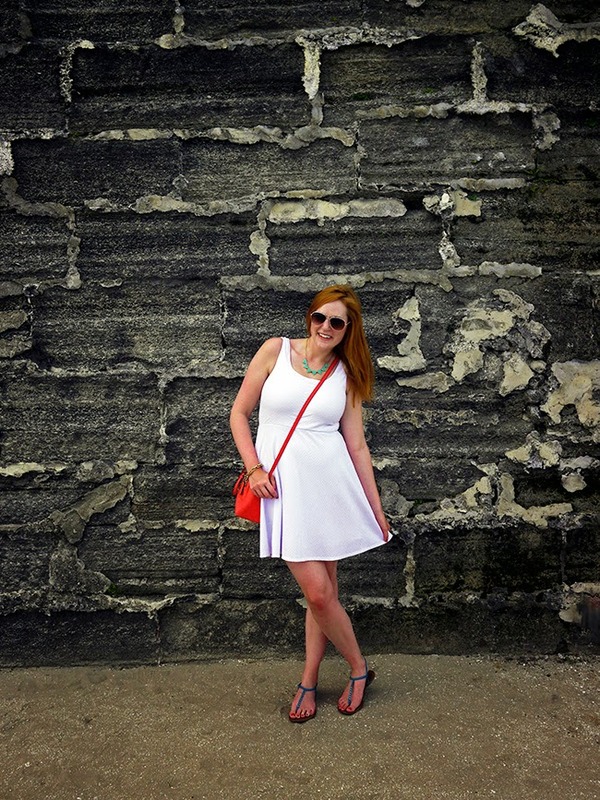 Linking up with Mix it Monday, Summer Style and Stylish Tuesday. You look so cute! I love the pop of color with the red bag. And you look like you actually stand a chance of staying sort of cool in a light outfit like this! I lived in Florida for 3 years and still I have never been to St. Augustine! I've always wanted to go! You look gorgeous - I love that dress! This is such a cute dress, perfect outfit for a day of sightseeing! Love the dress and the belt together, simple but chic. Love when I find a classic dress at Target! You look so cute. You're such a chic traveler. That is a fab dress! FAB DRESS!! You look beautiful!! I love a good white dress that yours is amazing!!! 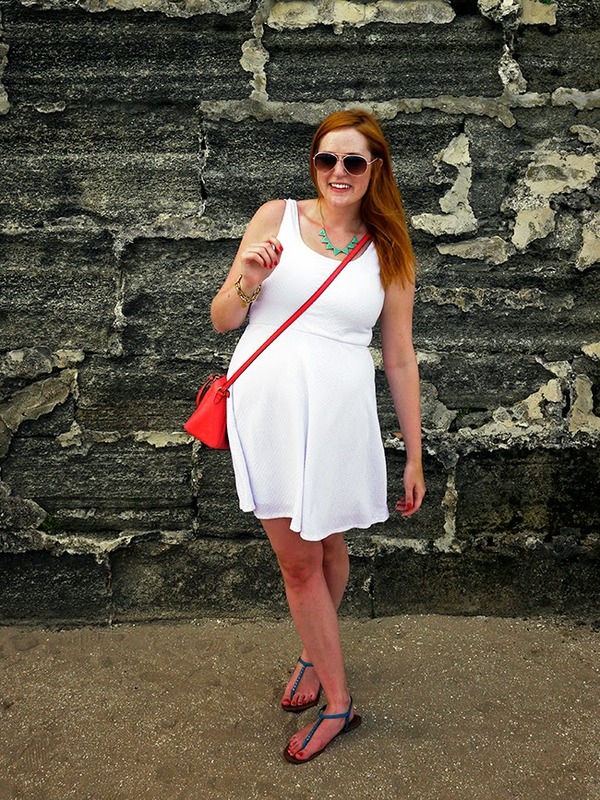 A little white dress and bright accessories are the perfect travel look! I love that you aren't worried about getting dirty (because that is what everyone else would say). Oh my gosh, I would just hide inside all summer. Oh it was so cool, you should definitely check it out if you get the chance. Thanks Abby! I'll check it out. I don't think I'm ever worried about getting dirty, although I probably should have thought about that before sitting on that cannon!